High rates of diabetes, obesity and a lack of focus on preventive medicine were blamed after Gulf countries slumped in a global health ranking. No Arab nation was in the Bloomberg Healthiest Country Index’s top 35 this week, despite the region’s significant wealth. Six of the top 10 nations were European, with Spain overtaking Italy as the world’s healthiest country. Japan, Australia, Singapore and Israel made up the rest of the leading 10 nations, with less-developed countries such as Cuba making the top 30. In the rankings, which are based on factors such as life expectancy, obesity, death rates and exercise levels, the UAE fell three places from its 2017 position, making it the 46th healthiest nation out of 169. The highest-performing Gulf country, Bahrain, rose four places to 36th, overtaking Qatar, which fell one place to 37th. Kuwait fell by 22 places – the second-steepest drop recorded – to 78th. 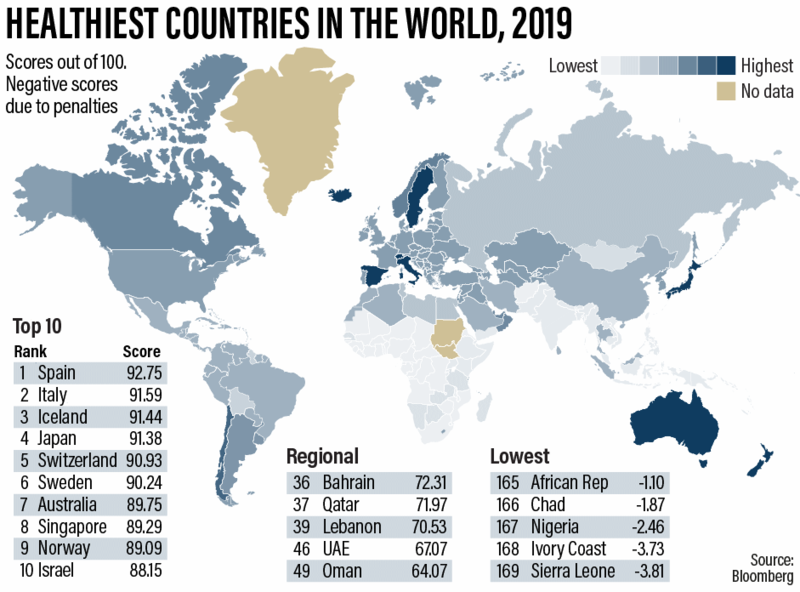 It tied with Saudi Arabia, which recorded a fall of six places compared with 2017. Dr Raghib Ali, director of the Public Health Research Centre at New York University Abu Dhabi, said the findings revealed an urgent need for a better understanding of the effect of changing lifestyles. The NYUAD centre is working on a long-term study of 20,000 Emiratis to find out why the country has some of the world’s highest rates of obesity, heart disease and diabetes. Although lifestyle is a factor, genetics and environment may also play a role. “The UAE Healthy Future study seeks to understand for the first time the importance of the causes of diabetes and heart disease and how to prevent them,” Dr Ali said. “For the UAE and the wider region, there also needs to be a greater focus on preventive care. Studies found that the Mediterranean diet, high in fruit, vegetables, fish and low in red meat, may help to explain the high life expectancy in Spain and Italy. A strong health system in Cuba and a focus on preventative medicine there was credited with its relatively strong performance, given its wealth. The country was 30th in the rankings, beating all the Gulf countries and the US. Malta, Greece and Cyprus were other nations to make the top 30 despite having modest economies. Of the 30 unhealthiest nations, 27 were sub-Saharan economies. Yemen, Afghanistan and Haiti were the others. The UAE took measures over recent years to improve health, such as increasing taxes on tobacco and sugary soft drinks. 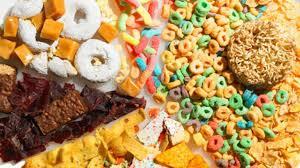 But levels of obesity and diabetes remain issues in a country with a strong fast-food culture. Bloomberg gave countries a health score out of 100 based on factors including life expectancy and child mortality levels. A penalty score, calculated on factors such as smoking, high cholesterol, mental health provision and air quality, is subtracted from the total. The popularity of fast food and takeaways in the UAE is fuelling poor health, said Dr Girish Banwari, medical director at the LifeWorks health clinic in Dubai. “Genetic predisposition to health issues is a non-modifiable risk factor,” Dr Banwari said. “But lifestyle factors and preventive care are under our own control. “In a country like the UAE, eating out and ordering food is a norm rather than an exception, which leads to overindulgence in processed food, sugar-laden beverages, salt and trans fat. “Living a comfortable, sedentary lifestyle that lacks physical activity is common. An unhealthy lifestyle increases proneness to metabolic problems – weight gain, obesity and diabetes – which increase cardiovascular morbidity.